Your Functions on the left of the Home Page is a list of marked record types and also actions carried out within the database by you. They are displayed with the number of records shown in the Count column and a date filter column. 1. Clicking on the black arrow to the left of the function will take you straight to those records in List View. 2. To filter the function by date, click on the option displayed in the filter options column and select from the dialogue box. 3. 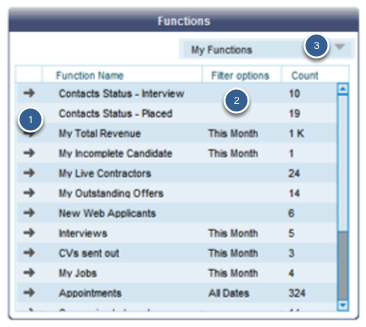 You can also view other people's functions (if you have the necessary privileges) by clicking on the My functions drop down arrow at the top of the functions list.